Nearly three weeks ago, my family received some devastating news—my brother Bill had suddenly passed away at the age of 57. This unexpected tragedy was extremely difficult to handle. Only our faith in God and the support from the church enabled us to navigate this painful stretch of life’s journey. A few days after learning of my brother’s death, I was walking along a stretch of highway near my home. I noticed that the recent rains had caused part of the hillside alongside the road to crumble. 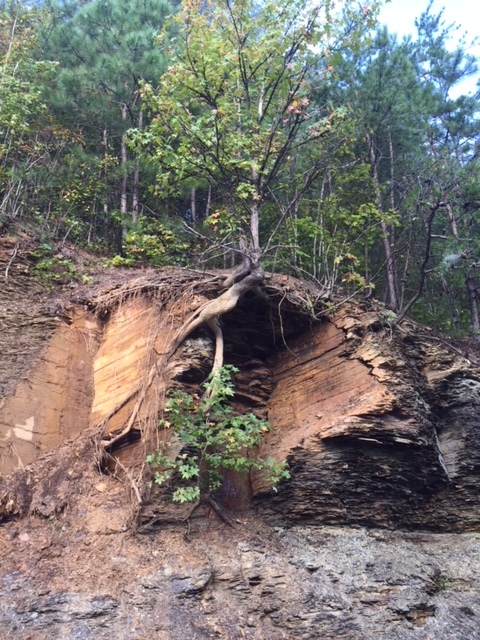 I also noticed that a small tree perched precariously on the side of the hill remained upright in spite of the collapsing hillside. Its roots had grown deep into the side of the hill, and it held on defiantly, in spite of the serious threat to its well-being. The Bible says that we are to put our roots down deep into our faith in Jesus Christ. When we do, no circumstance in life, not even death, can move us! “So then, just as you received Christ Jesus as Lord, continue to live your lives in him, rooted and built up in him, strengthened in the faith as you were taught, and overflowing with thankfulness.”—Colossians 2:6-7. This entry was posted in Christian Living, Communion Meditations and tagged Bill Cox, Colossians 2:6-7, facing death, illustration, living in Christ, perseverance, rooted in the faith, strengthened in the faith. Bookmark the permalink. Your strength and other people’s strength in our church has taught and shown me how to be secure in my faith. Thank you for that.